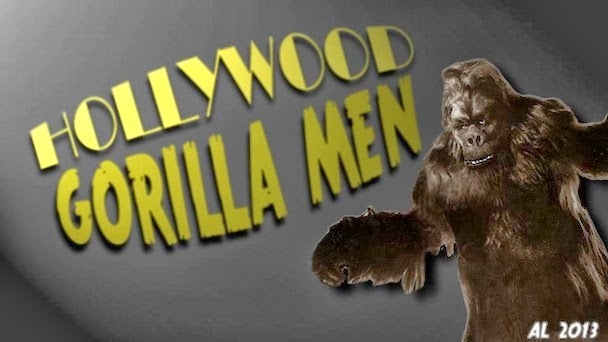 Hollywood Gorilla Men: Chris Walas's Build-Up Gorilla Bash !....Part 6!!!! Get Your Stinking Paws On ! 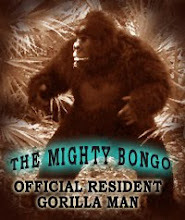 Chris Walas's Build-Up Gorilla Bash !....Part 6!!!! Get Your Stinking Paws On ! 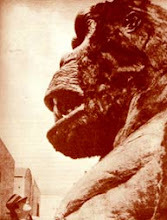 OK gang, we've got the head and mouth shaping up nicely now. We'll take a break from his fearsome face, and move onto the hands! As you've already seen, Chris Walas is an absolute master of his craft, one of the best in the world in fact. We, are so very fortunate to have Chris share this amazing project with us as a tutorial, and we can't thank him enough for his generosity ! But lets not delay a minute longer, and we'll rejoin the master ! Hands are a lot of work, regardless of whether you sculpt them or build them up. It's a lot more area than a face and there are two of them, so realize that a pair of hands will potentially take longer than a whole head. 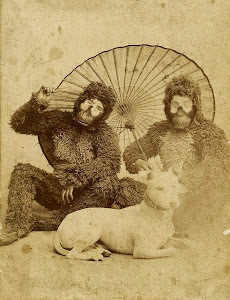 I've picked an old pair of garden gloves and stuffed the fingers with heavy paper. the pare allows for a slight amount of possibility and I'm giving the fingers a little bend to work with. I want these hands to be on the big side as this character will be interacting with other characters a lot and the larger hands will be more intimidating. 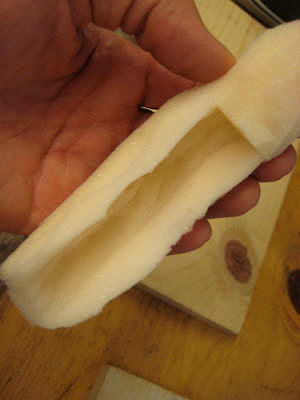 I'm forming the hands out of polyfoam and once the rough size and shape looks good, I razor a slot out of the palm side of the finger so that it will sit over the existing glove finger. The fingers should completely cover the glove fingers on three sides. As I don't want to add too much to the thumbs, I've only added some mass at the base of the thumb. I'm doing both hands as much at the same time as I can so that I can keep a better eye on matching. 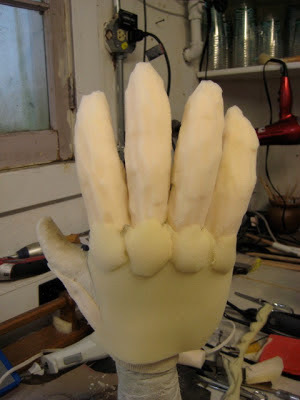 Next, I wrap the hand in 1/2" foam on the back and palm sides. What I don't have a picture of is some foam padding I added on the outer sides of the palms to make them larger. To keep the finger I'm working on from sticking to the finger next to it, I've simply rubber banded the next fingers together. It doesn't really matter where you start, but I chose the little finger to begin the batting/latex coat. I used two sections of batting, the first covered the under- or inside of the finger and the outer layer was layer over that. 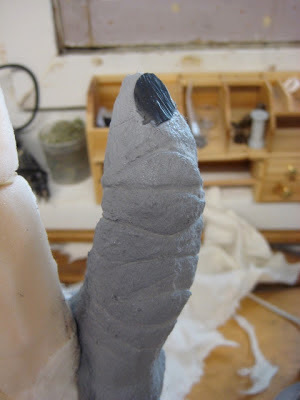 I tried using some latex sheet as fingernail material, but I wasn't happy with it and only used it on a few of the fingers before I switched to just forming the batting as nails. This is not the finished finger! Just in case there's anyone out there who is not familiar with cotton batting, it's one of the materials quilters use inside a quilt. It's almost like a very soft, thick felt in texture. After the little fingers, I did the thumbs and the base of the hand. Yes, those gray Vans will become the feet. You'll notice that I have brought the work all the way down to the wrist. This is because I want to be able to glue the base of the glove to the inside of the forearm foam form later. A little bit more work and the entire hand has its first coat. Once this is dry, I'll add another entire coat of latex and then an additional coat on areas that will get more use. Then they will be ready to attach to the forearms and get furred!